Sherwani is the Indian garment designed for men which evolved during the British era, because of the Mughal influences. It is worn over a kurta and is often paired with salwars, churidar, dhoti or a pyjama which are apt for the lower bottom wear. Sherwanis’ are often made from heavy fabrics and a firmer lining which holds the fabric better so that the fitting is close to the body. Sherwani for groom is popular among Indians and is used as the to-go festive wear for any occasion. Men in Rajasthan, Uttar Pradesh, Punjab, Bihar, Gujarat, Jammu, Hyderabad, Maharashtra and many other Indian countries are known to wear Sherwanis since they are the most Indian form of extravagant clothing. Materials like Khadi and cotton were used in the start. Nowadays the materials range from synthetic fibres, nylon, rayon, silk and velvet. Changing times have bought about changing fashions which on impulse affect clothing wear for both men and women. 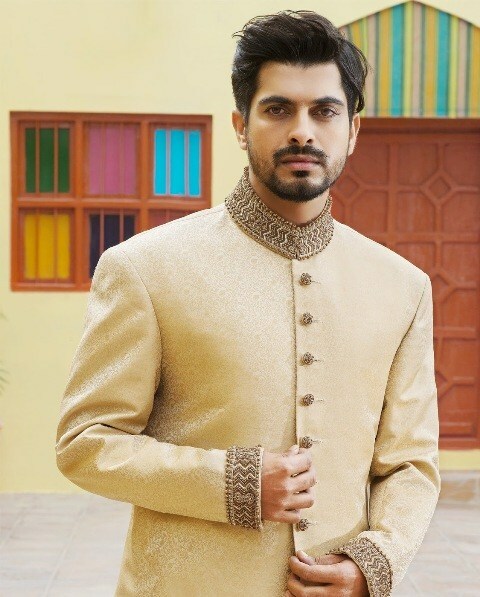 Therefore, the Sherwani is no more limited to plain designs and usual fabrics. They have changed over time to create much more intricate detailing, heavier silkier fabrics and jewelled seams. - Banarasi Silk Fabric: Banarasi Silk Fabric is such an ethnic rich material that it is used to create a variety of garments for both men and women. Banarasi silk is popular for traditional sarees and Sherwani ensembles. They are versatile and can be combined with a number of other fabrics to create sturdier and resilient creations which are both beautiful and everlasting. For Sherwanis, Banarasi silk fabrics have become one of the most sought after materials. - Chipkan Style Sherwanis consist of heavy fabric like synthetic combinations, Zari work and panelled seams of rayon or silk. Brands like Raymond, Manyavar and Rajwadi are popularly known for these styles. - Fabrics like brocade, silk, cotton, georgette, imported Italian fabric, Linen, Matka Silk, Patola Silk, Pure Silk, Raw Silk, Zari, Polyester embroidery, Kashmiri Embroidery, pearls, sea shells and many more indigenous elements are used to create pure unique Sherwanis. - Indo western Sherwanis are made by brands like Manyavar, Fashion curries, Abhivani, Royal men and Ethine Men. - Achkal style Sherwanis are created by brands like Raymond, Peter England, Manyavar and Fashion Curries. - Angrakha Sherwanis are created by brands like Fashion curries, Raymond, Peter England, Mohanlal Sons and Royal Men. - Printed Modern Sherwanis are created by Diwanshaheb, Manyavar, Raymond and Peter England. - Anarkali Styled Sherwanis are often bought online since many independent designers create these exquisite Sherwanis which are made of rich thick fabric that can match nothing else. - Raymond is one of the most popular brands for the creation of Sherwanis. - Indian Fashion designers like Manish Malhotra, Rohit Bal, Manish Arora, Tarun Tahiliani and many more have created beautiful designs for the authenticity of Sherwanis to continue being regal, extravagant and proudly Indian.